Yes, that is yet another pair of Blueberry Waffles socks. I’ve been overcome by a bit of a waffle frenzy. 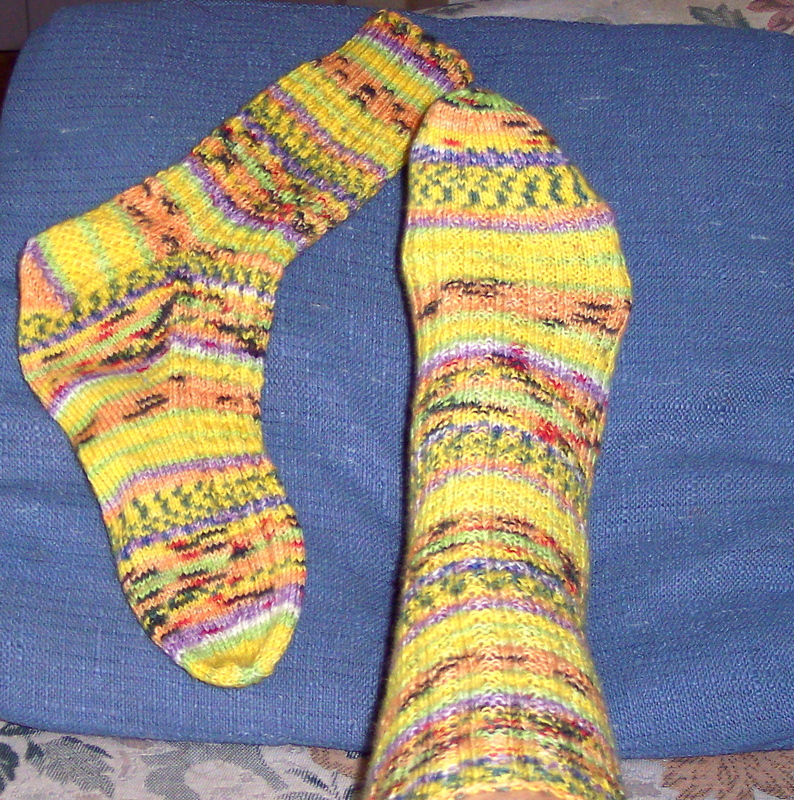 Celtic Spirit and Raspberry Waffles have been successfully delivered to cousin Vickie, who loves them, BTW, as I knew she would, and these lovely yellow and multi-colored waffle socks are mine, Mine, MINE! They were knitted with Opal Hundertwassers Werk 894 in color 1431, yellow with orange, green, blue, purple, black, and a touch of red. I did an eye-of-partridge heel and my favorite round toe. That’s my foot modeling the finished product. Imagine that at my advanced age, I have become a foot model. Who knew?☺ Life is full of surprises. Yesterday evening I received one of life’s surprises. Although I am not a Democrat, I was watching the Democratic National Convention roll call vote on television. Hillary Clinton, speaking for the New York delegation, moved that Barack Obama be nominated by acclamation and, suddenly, a major party had nominated a black man for president of the United States. This was not a surprise. Everyone knew that Obama would be the Democratic nominee. The surprise came in my reaction to this historic and momentous event. I was, quite unexpectedly, totally overwhelmed with emotion. I started crying and couldn’t stop. Having grown up in the 1960s, I remember the civil rights struggle vividly. It’s been a long, uphill struggle, and it isn’t over yet. But in a country where people can still be arrested for the “crime” of “driving while black,” seeing a black man win the nomination of a major political party to run for president shows that we’ve come a long way, baby. Yes, we still have a long way to go, but, cliché or no, a journey of a thousand miles begins with a single step. And I think we are well on our way to a better America. Had it been left to the conservatives, the South would still be segregated and Barack Obama’s candidacy would have been impossible. But fortunately, the progressives won the day and the Civil Rights Act and Voting Rights Act that turned the South from Dixiecrat to Republican became law. The change has been slow, and the regressive right has tried their damnedest to take us back to the “good old days” of Jim Crow, but that particular genie refuses to go back into the bottle. Life is full of surprises. Maybe in November the good people of the United States will elect as president someone who represents our widely-shared progressive values of equality, justice, unity, democracy, and human rights instead of giving us four more years of corruption, warmongering, human rights abuses, degradation of the environment, anti-intellectualism, deliberate incompetence, militarism, cronyism, fear-mongering, divisiveness, and repression. The choice is black and white (pun intended): If you want to continue with out-of-control spending and out-of-touch leadership; if you want the rich to keep getting richer while the rest of us see our standard of living slipping ever downward; if you want America’s reputation and influence in the world to continue its downward spiral; if you want to live in a perpetual state of war and fear, then vote for John McCain. But if you want a more humane America; a country that leads by good example; a country that does not torture; a country that tries to live up to its ideals of social and economic justice, of legal equality, of equal opportunity; a country that cares about the future of the planet and all its inhabitants; a country in which humanitarianism is a higher priority than militarism; a country in which housing, health care, and higher education are available and affordable to all its citizens; if you want these things, vote for Barack Obama. Yes, indeed. Life is full of surprises.